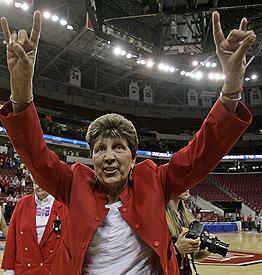 Women's college basketball lose legendary coach at 66 to cancer. N.C. State head coach Kay Yow died on Jan. 25 after losing a long battle with cancer, dating back to 1987 when she underwent surgery for breast cancer. During her career, Yow inspired generations of players, won 737 games, is honored in the Women's Basketball Coach Hall of Fame and is No. 6 on the women's coaching career list. After Yow's surgery in the late '80s, the cancer returned over a decade later in 2004. Yow was told in 2006 that the cancer had spread to her liver, and took a 16-game leave of absence. Even though Yow wasn't sitting on the sidelines rooting her team on, her players brought a lot of heart and passion to prove to Yow just how much she meant to them. Watching N.C. State upset No. 1 ranked Duke in the A.C.C. tournament in 2007 really gave Yow a reason to continue coaching. Her players wanted to win the NCAA championship for their coach, and she wanted them to achieve something they could cherish for the rest of their lives. Following Yow's return, players began wearing pink shoelaces and headbands for breast cancer. The NCAA also got involved with Women's Basketball Coaches Association's "Think Pink" or now "Pink Zone" to help raise money to be donated to the Kay Yow/WBCA Cancer Fund. Teams participating in "Think Pink" or "Pink Zone" would not only wear pink accessories but wore pink uniforms to raise awareness about breast cancer and money for the foundation. Unfortunately, N.C. State did not make it to the final four, but did inspire people with their determination to overcome ranking status and make an impression early on in the year. Kay Yow's obituary in The New York Times.